Trump blasted the microblogging platform for "discriminatory" practices Tuesday morning. Are Anti-Gunners Trying to Bankrupt Pro-Gun Orgs Through Regulation? Many Democratic leaders will not even utter Christ's name, perhaps because they would burst into flames if they did so! This human trafficking operation, commonly referred to as the refugee resettlement program, is turning America into the third-world hellscape. All dog owners are white supremacists - or something. A video appears to show the Sri Lankan terrorists pledge their lives to the Islamic State after the terror group took responsibility for the attacks. Gov. Larry Hogan is considering challenging President Trump in 2020. The Israeli Prime Minster said the gesture was meant to thank President Trump for recognizing the territory as part of Israel. Bill de Blasio’s Plan to Fight ‘Global Warming:’ Ban Skyscrapers! Another failure of the American immigration system. Once again, a Democratic Party politician wants a different set of rules for himself. "Honk honk," said the clown to the drag queen. E.W. Jackson was banned from Twitter for tweeting about Islam. The ordinance could make it illegal to contact police if they believe the call was racist in nature. Mayor Pete cannot change what it means to be Christian. The NeverTrump crowd has been working against the President since the beginning. 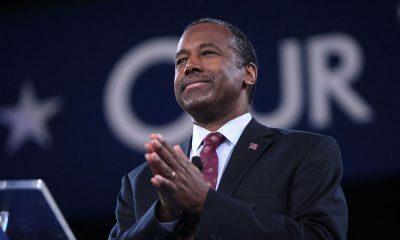 Carson's plan would serve American citizens and deny illegal immigrants.